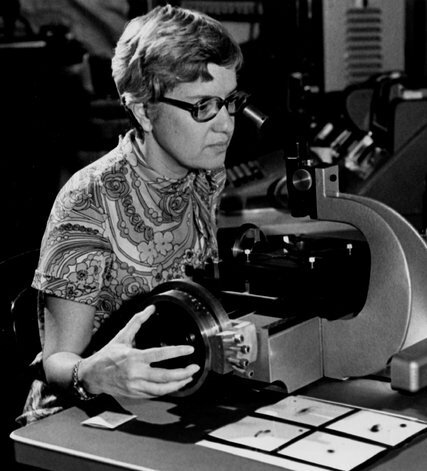 Vera Rubin (1928- 2016) was an American astronomer whose work focused on dark matter. During the 1970’s, Vera along with a colleague, Kent Ford, worked on measuring the rotation of spiral galaxies. They discovered that stars at the outer edges of galaxies spun “at least as fast around the centre as those in the inner regions”. This was checked through the examination of more than 60 spiral galaxies and the discovery was confirmed in every galaxy. The existence of a substantial amount of dark matter provided the most-reasonable explanation for those findings. In 1948, Rubin graduated from Vassar College where she studied astronomy. In 1951, Rubin earned a master’s degree from Cornell University. In 1954, she earned a Ph.D. from Georgetown University. In the 1960’s, she became the first woman permitted to use the Hale Telescope at the Palomar Observatory at Caltech. In 1981, she was admitted into the National Academy of Sciences and in 1993 she was awarded the National Medal of Science.